Full scripture for this Sunday is available on the Catholic Ireland website. Daily Scripture is also available. Our parish Prayers of the Faithful for this Sunday are made available on the Dublin Diocesan website. Jesus took with him Peter and James and his brother John and led them up a high mountain where they could be alone. There in their presence he was transfigured: his face shone like the sun and his clothes became as white as the light. Suddenly Moses and Elijah appeared to them; they were talking with him. Then Peter spoke to Jesus. ‘Lord,’ he said ‘it is wonderful for us to be here; if you wish, I will make three tents here, one for you, one for Moses and one for Elijah.’ He was still speaking when suddenly a bright cloud covered them with shadow, and from the cloud there came a voice which said, ‘This is my Son, the Beloved; he enjoys my favour. Listen to him.’ When they heard this the disciples fell on their faces overcome with fear. But Jesus came up and touched them. ‘Stand up,’ he said ‘do not be afraid.’ And when they raised their eyes they saw no one but only Jesus. Things are not always as they seem. Under the church here I work in are a series of underground passages for about a mile! People the same – talking to someone and they tell you they are very ill, or recovered from addiction…you see more to them. Or you find out that someone you thought little of visits an elderly person every week. People are not always as they seem. The mountain visit was the same: the apostles saw Jesus – son of God, radiant in prayer, and in the middle of it all the Passion was announced. They saw the person behind the face. The big truth of Jesus is that he is intimately united to God the Father. So following him is not just action, but prayer that leads to action. We say someone is a great Christian – he or she helps the poor. Christianity is more – it is also prayer and the Eucharist. While we are thankful for the good lives of many people, we also can say that the full Christian life includes prayer. It also involves community – the three were called to witness and help each other remember the Lord Jesus. Community brings the word of God alive in a real way. The gospel in the community of the church brings us to fuller faith. Prayer leads to action for others, and action leads back to prayer. We can be so close to heavenly things that we are no earthly good. Lent brings us into this mystery of the death and resurrection of the Lord – we are part of this, and we try to make life a resurrection-grace for others. We can transfigure the lives of others, or disfigure. 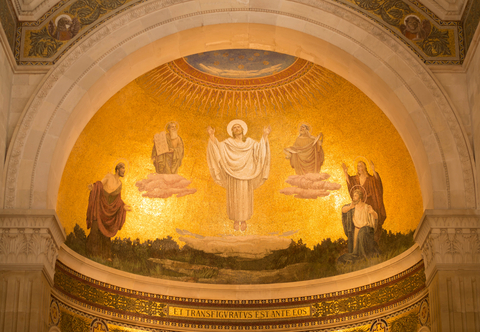 Let’s be people of the transfiguration. Lord show me your face – in myself and in others. Amen. This entry was posted in Gospel of Matthew, Gospel Reflection, Liturgy Resources, Prayer Resources, Scripture and tagged Donal Neary SJ, God’s creation, Gospel Reflection, Jesus, Lord Jesus, March 16th 2014, Matthew 17:1-9, prayer and action, Scripture and Reflection for 2nd Sunday Lent Year A, Second Sunday Lent, Sunday Gospel and Reflection for 16th March 2014, Transfiguration. Thank you for helping me understand the Gospel of the Transfiguration and bring to my mind the richness of this Lenten reading. The last two sentences express a meaning I can reflect on this week in Lent! I am glad I discovered your website! Fr Neary served as Parish Priest at Gardiner Street prior to this and publication of this blog has being transferred from Gardiner Street Parish to the Messenger.